Phil Rees Music Tech built computers for music and manufactured MIDI accessories. 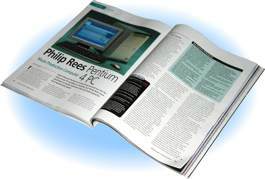 In December 2006, the company ceased trading..
One of our advanced studio computer systems was reviewed in the July 2005 issue of Computer Music magazine. "This is the quietest, best-designed PC we've ever seen, period". Their review concluded: "This computer is simply superb. The build quality, including that of all the mods, is excellent. Inside, the cables are neatly tied and everything is engineered to provide the most efficient cooling possible. This, coupled with the extensive (and innovative) acoustic treatments, makes for a phenomenally quiet computer that's both powerful and unintrusive in the studio". One of our Centrino-class laptops was reviewed in the September 2004 edition of Computer Music magazine. They rated this system at 9/10, and gave it another Performance award. They called this audio notebook PC "one powerhouse of a portable music platform", and praised its "solid reliable glitch-free performance". They summed it up as "Overall, a great machine, then", and said "this laptop is worth every penny of its asking price". They also commented that "the attention to detail in the setup of the software is exemplary". Martin Walker reviewed one of our advanced systems in the January 2005 issue of Sound On Sound magazine. This review can be read online. "This Philip Rees PC is a luxury system from start to finish, featuring some of the best components available, and with lavish care and attention to detail throughout". He concluded his review: "I'm extremely impressed by the high standard of engineering and build quality of this Phil Rees PC, its luxury case and fans, proprietary central airflow control system, quality RAM and drive cooling, and the attention to detail evident in features like the multi-boot install and bundled office suite. Whatever your views on Intel's Prescott processor range, this review system is an excellent advert for Phil Rees and his company". Of our claim to produce 'astonishingly quiet machines', Martin Walker wrote: "I'll say right at the start that Phil has achieved his claim with flying colours". Miscellaneous articles - technical writings by Philip Rees (some call me Phillip Rees). Announcements - news and press resources. Author: Philip Rees, not Reef, Reece, or Reese. 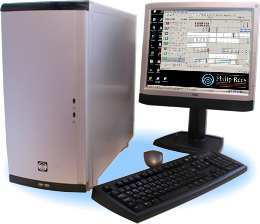 Our specialist music computer systems include excellent computer audio laptop machines.